Maritime Electric is reviewing its security measures after a 17-year-old girl broke into its Charlottetown energy plant and climbed 30 metres up a smoke stack early Thursday evening. The girl was on the smokestack for more than an hour before firefighters were able to rescue her by extending a ladder off a fire truck, Charlottetown police confirmed. Maritime Electric spokesperson Kim Griffin said the company is relieved the girl was not hurt. 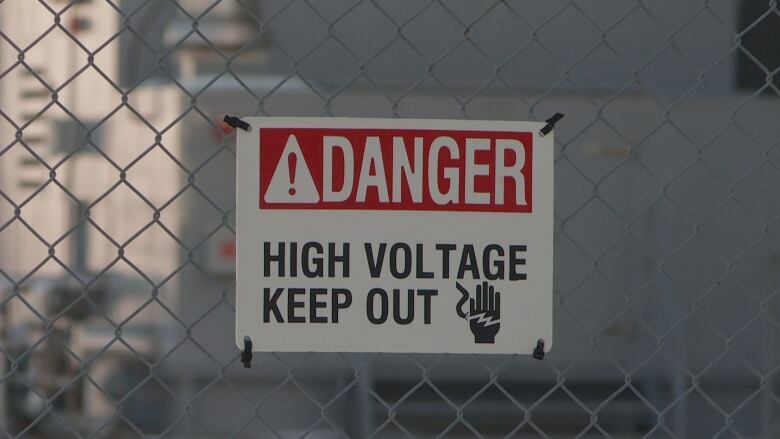 But she said the fact the girl was able to break into the secured area, which is surrounded by fencing and is monitored 24/7 with security cameras and staff, and climb the smokestack is a "major concern." "It certainly took some effort," she said. Griffin said Maritime Electric did an investigation the night of the event, as well as a full internal investigation on Friday, and is looking to take additional security measures. "It's a huge safety risk," she said. "It's never happened before that we know of and it's certainly a major concern to our company." Maritime Electric has an application in to the Island Regulatory and Appeals Commission to have the smokestacks decommissioned, Griffin said. The company has had issues in the past with people breaking into its substations and stealing copper. Griffin said people who enter the sites are not only putting themselves in danger, but also endangering Maritime Electric staff. "There is a lot of signage asking people to stay out," Griffin said. "It is a work zone but it is also dangerous from an electricity perspective. It is not a place to come into unescorted without authorized personnel."